This storage container is vented and allows for improved sanitation. 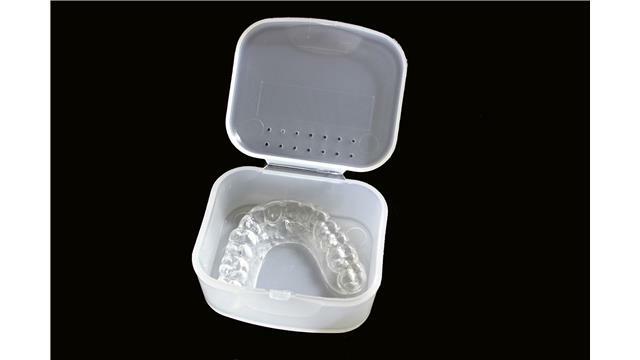 It is used for all dental removable appliances including: mouthguards, snoring mouthpieces, nightguards, orthodontic retainers and appliance, partial and full dentures, and other dental devices. •	Your product was inspected before shipping. •	We guarantee 100% satisfaction with any items we sell. •	We will accept returns for exchanges or refunds within 15 days of receipt. •	If an item is found to be defective upon receipt simply contact us by email (info@mouthguardstore.com) first for approval and then return the defective merchandise to us in its original packaging in a re-sellable, undamaged condition for a full refund. •	No refund is available for a used product. •	Please note that shipping charges are not refundable. •	Refund requests will be processed within 7 business days of our receipt of the defective merchandise and verification of the described flaw(s). This product is a life saver, it not only holds my mouth guard, dripping with saliva, it has a handy-dandy travel friendly case.